How to connect end system to edge router? NOT the same as the traditional telephony. The ISP would you to use TCP. Because TCP is more polite and follow the rules. Try to hack TCP, you will get benefits. end-to-end resources allocated to, reserved for "call" between source and destination. End systems connect to the Internet via access ISPs. Why need to divide into pieces(layers)? Physical: bits "on the wire"
All the transport must go through the physical. The router will go up through the layers and go down again. And all of these add delay. Process: program running within a host. Application with P2P architectures have BOTH client processes and server processes. initiate TCP connection: not too much time cost on the server side. Server leaves the connection open after sending response. privacy issue，设置不能跨域设置Cookie。However，advertising companies can obtain info across sites. user agents to server is using POP3 IMAP or others. built trust is very hard in a distributed system! Each peer only aware of immediate successor and predecessor. is the number of the node. Example: Propagation(传播), Caravan(车队), Spatial(空间), packet transmission is more like transport traffic. 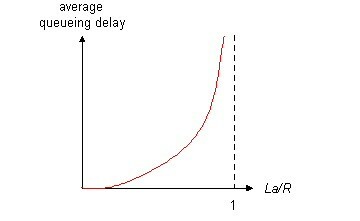 b = length of buffer. The first M: Poisson arrival process. This should be a stable system. Long-term average. traceroute command, base on TTL, this time is use as "hop to leave"
3ACKs 优化问题 （Fast Retransmit, Page36）: If sender receives 3 ACKs for the same data, it supposes that segment after ACKed data was lost. Sender won't overflow receiver's buffer by transmitting too much, too fast. Even though the connection started at low, if the session is long enough, the bandwidth will be allocated fairness. Once the trajectory hits x=y line, it stays there. All the thing can be done in network, but follow the philosophy. ATM(Asynchronous Transfer Mode): is complex in core. output queuing，same as the input, because we have queue, queue might be filled up. If filled up, then it is possible to drop packet. If you don't want to drop packet, some signal must be implemented. because of queuing, the order of the packet might be changed. header length includes 40 bytes header. The messages are peer to peer, so that the message will not be sent to the server. But it will go to the other peer direct. "The peers need not to be concurrent." means one peer can only communicate with one peer at a time? YES. Directory server do not have responsibly for the actual availability of the client. Take the IPv6 packet but put it into IPv4 packet. "distance vector" [[distribution implementation of Bellman-Ford Algorithm]] never end. keep tracking the changes of the network. Poisoned Reverse. It avoid if some route is highly delayed. OSPF "advanced" features not in RIP. This is not compression at all. For example 1,2,3,4. Those who want to lowest quality, use stream 1. Those who want more, use stream 1 and steam 2. VoIP may use fixed layout delay. Bloom filters: if origin has k chunks, generate k+m chunks such that ANY k chunks is sufficient. Research project. Unsolved open problem. how to address a callee. no matter what IP device callee is currently using. works with RTP, more like telephone. Think: How to do QoS for different class of traffic? Finishing this chapter. Multimedia Networking: Summary. how to monitor Internet access? Even a slight difference on file, the Hash of those files should change drastically. IKE also contains key exchange. For Assignment3, we need to consider we should not use such a powerful server. Machine learning for normal model for the network.